The Wild, Scatter, Free Spin, Multipliers and Bonus opportunities in this action-packed game are complemented by attractive graphics and the introduction of two great new reward features - the innovative Sneak A Peek and a cumulative Free Spins + Multiplier function that make this fascinating game even more absorbing and rewarding. 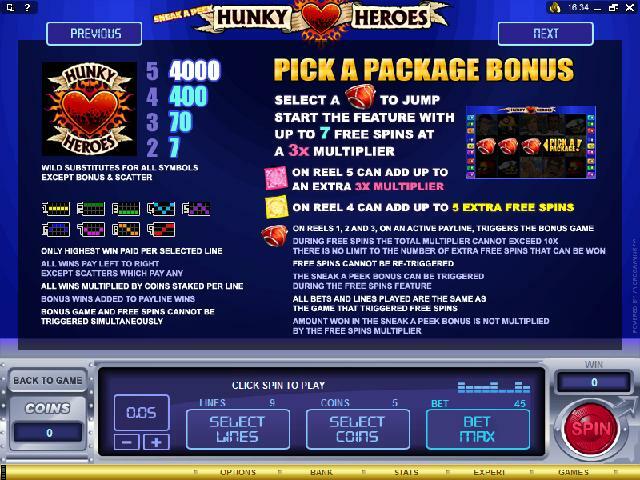 The Wild in Hunky Heroes is appropriately the heart, which can be used to complete prize-winning combinations across the reels, whilst the risqu� element comes into play when Scatters, or packages portrayed as scants appear across reels 1, 2 and 3 on an active payline. 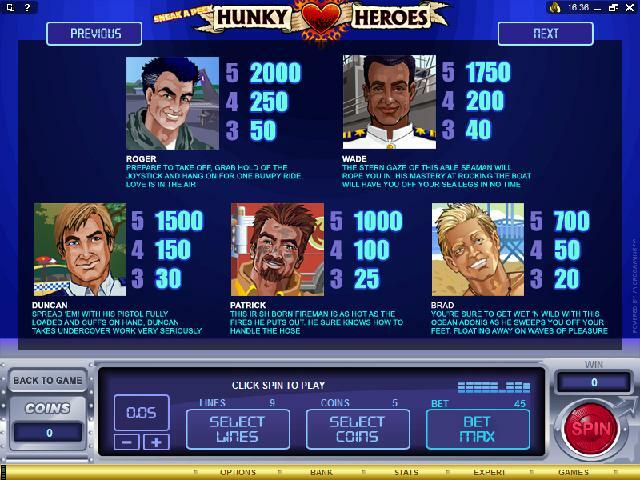 This triggers the on-screen Bonus Game and a crack at tasty free spins and multipliers. When that Sneak A Peek symbol appears on any position on Reel 1, the corresponding position on Reel 5 is reserved and if any one of the 5 Hunky Heroes lands in the reserved position, the Sneak a Peek bonus is unpacked, with a scratch card choice of 12 from 15 opportunities. This game offers so many chances to win, and a corresponding range of impressive prizes. 5 everyday heroes will help you win a based Jackpot of $10,000 and a further $100,000 via the no-limit Free Spins + Multiplier Bonus Feature.